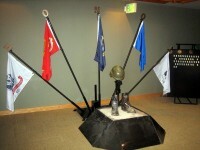 For over 30 years, there has been a Veterans Center located at Salt Lake Community College. The original function of the 178-square-foot office was to process the claims and paperwork for all of the veterans attending SLCC. Now, the Veterans Center is so much more than that. Back in 2005, the Veterans Center was located on the second floor of the Student Center. It held Veterans Affairs (VA) records and three work stations. At that time, there were only two college employees, one full-time and one part-time, who shared one phone line. They were the ones that would process all benefits, paperwork and claims. During this time, there were between 300 and 375 veterans attending SLCC each semester with no outreach resources. In April 2007, a proposal was written to have an inclusive center at SLCC for a “Veterans Resource Center.” This center would provide an area to support and encourage veterans in making the transition from military active duty to civilian life and college. The college saw the need for additional support for veterans and found the perfect space for the center. On October 13, 2008, the Veterans Center was dedicated in the basement of the Student Center. When the center opened there were three offices, a large work area, a lounge where the veterans could study or decompress, four computers for them to complete assignments and a printer to print homework or assignments. There were six veteran work study students employed to assist other veterans with their needs. Veterans also have access to meet with VA representatives. There is a “Vet Success” VA counselor on campus to help them with their needs. In addition, Veterans Upward Bound that provides free tutoring for veterans in math, English and computer science, and there is a vet representative from the Department of Workforce Services available to assist with financial and employment needs. As of Fall Semester 2010, veteran enrollment was up over 100 percent with 850 veterans using benefits. SLCC now monitors 15 different types of education benefits. In Spring of 2010, 110 veterans graduated from SLCC. A new tradition here at SLCC is that when a veteran graduates they receive and wear a red, white and blue Veterans Honor Cord to honor them during the graduation ceremony. “We are proud to be considered as a model institution for veterans in the State of Utah and the nation,” Head said. Every year on the birthday of each branch of military service for the Coast Guard, Air Force, Navy, Army and Marines, those that have served and are currently serving are highlighted and honored by having birthday cake in the Veterans Center. In the Student Center at SLCC, there is a monument called “The Fallen” built by Josh Crowell, a VA student who donated a sculpture that he made while taking a welding course. As the title of the monument indicates, Crowell wanted it dedicated to our nation’s fallen soldiers.